Sick of pausing and rewinding YouTube tutorials to replay that tricky part? Jumprope is a new instructional social network offering a powerful how-to video slideshow creation tool. Jumprope helps people make step-by-step guides to cooking, beauty, crafts, parenting and more using voice-overed looping GIFs for each phase. And creators can export their whole lesson for sharing on Instagram, YouTube or wherever. 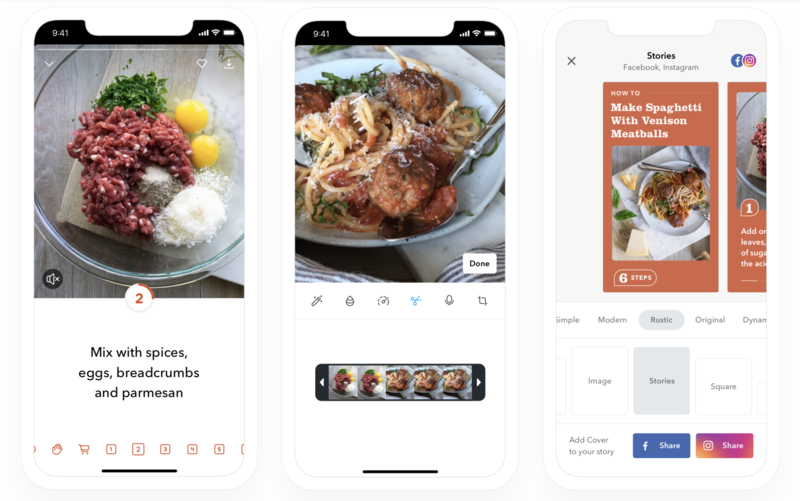 Jumprope officially launches its iOS app today with plenty of how-tos for making chocolate chip bars, Easter eggs, flower boxes or fierce eyebrows. “By switching from free-form linear video to something much more structured, we can make it much easier for people to share their knowledge and hacks,” says Jumprope co-founder and CEO Jake Poses. The rise of Snapchat Stories and Pinterest have made people comfortable jumping on camera and showing off their niche interests. By building a new medium, Jumprope could become the home for rapid-fire learning. And because viewers will have tons of purchase intent for the makeup, art supplies or equipment they’ll need to follow along, Jumprope could make serious cash off ads or affiliate commerce. Poses was formerly the VP of Product at Thumbtack where he helped grow the company from 8 to 500 people and a $1.25 billion valuation. He teamed up with AppNexus’ VP of engineering Travis Johnson, who’d been leading a 50-person team of coders. “The product takes people who have knowledge and passion but not the skill to make video [and gives them] guard rails that make it easy to communicate,” Poses explains. Disrupting incumbents like YouTube’s grip on viewers might take years, but Jumprope sees its guide creation and export tool as a way to infiltrate and steal their users. That strategy mirrors how TikTok’s watermarked exports colonized the web. Jumprope lays out everything you’ll need to upload, including a cover image, introduction video, supplies list and all your steps. For each, you’ll record a video that you can then enhance with voice-over, increased speed, music and filters. Creators are free to suggest their own products or enter affiliate links to monetize their videos. Once it has enough viewers, Jumprope plans to introduce advertising, but it could also add tipping, subscriptions, paid how-tos or brand sponsorship options down the line. 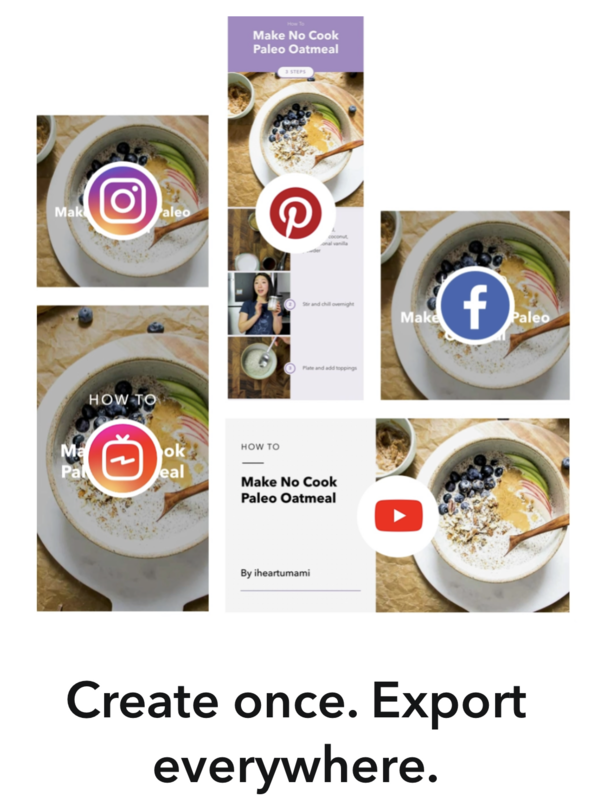 Creators can export their lessons with five different border themes and seven different aspect ratios for posting to Instagram’s feed, IGTV, Snapchat Stories, YouTube or embedding on their blog. “Like with Stories, you basically tap through at your own pace,” Poses says of the viewing experience. Jumprope offers some rudimentary discovery through categories, themed collections or what’s new and popular. The startup has done extensive legwork to sign up featured creators in all its top categories. That means Jumprope’s catalog is already extensive, with food guides ranging from cinnabuns to pot roasts to how to perfectly chop an onion. “You’re not constantly dealing with the frustration of cooking something and trying to start and stop the video with greasy hands. And if you don’t want all the details, you can tap through it much faster” than trying to skim a YouTube video or blog post, Poses tells me. Next the company wants to build a commenting feature where you can leave notes, substitution suggestions and more on each step of a guide. But the question remains who’s buying? Facebook is already discounting the 10-inch-screen Portal and 15-inch Portal+. Formerly $100 off if you buy two, Facebook is still offering $50 off just one until Christmas Eve as part of a suspiciously long Black Friday Sale. That doesn’t signal this thing is flying off the shelves. We don’t have sales figures, but Portal has a 3.4 rating on Amazon, while Portal+ has a 3.6 — both trailing the 4.2 rating of Amazon’s own Echo Show’s 2. Users are griping about the lack of Amazon Video support for Ring doorbells, not receiving calls and, of course, the privacy implications. Personally, I’ve found Portal+ to be competent in the five weeks since launch. The big screen is great as a smart photo frame and video calls look great. But Alexa and Facebook’s own voice assistant have a tough time dividing up functionality, and sometimes I can’t get either to play a specific song on Spotify, pause or change volume or other activities my Google Home has no trouble with. Facebook said it was hoping to add Google Assistant to Portal, but there’s no progress on that front yet. The hope seems to be that mainstream users who aren’t glued to the tech press where Facebook is constantly skewered might be drawn in by these device’s flashy screens and the admittedly impressive auto-zooming camera. But to overcome the brand tax levied by all of Facebook’s privacy scandals, Portal must be near perfect. Without the native apps for popular video providers like Netflix and Hulu, consistent voice recognition and more unique features missing from competing smart displays, the fear of Facebook’s surveillance may be outweighing people’s love for shiny new gadgets.